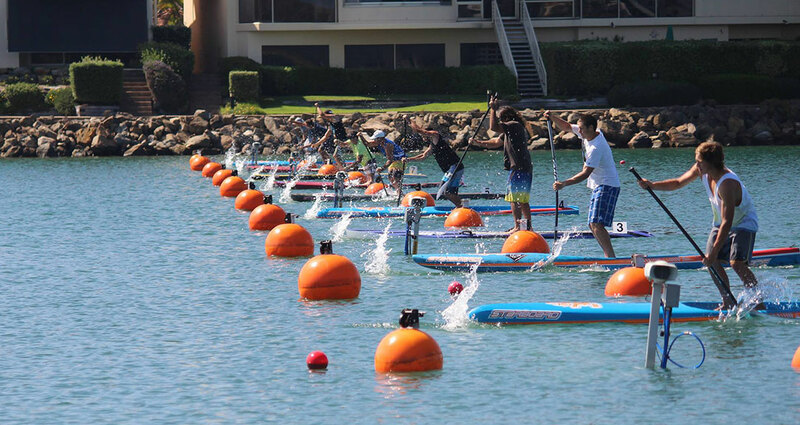 So while 99.9% of SUP races are “mass start” events, the SUPfest will see each paddler racing on their own stretch of water. This format is exactly the same thing you’d see in Olympic canoe and kayaking races and should provide a novel point of difference to the usual stand up paddling events. Names to look out for this weekend include the Gold Coasters Jake Jensen, Beau O’Brian, Paul Jackson and Angie Jackson, as well as fellow Queenslander and rising talent Trevor Tunnington. Those five are expected to dominate the sprints, though don’t count out the dark horses such as WA speedster Will Lee and Australia’s most insanely ripped paddler, Heath Meldrum. UPDATE: Young gun Trevor Tunnington takes the win in the 500m, before Jacko shows up the kids by claiming the 200m. Angie Jackson too strong in the women’s, sweeping both events. Scroll down for full results. As I said when we highlighted the Flatwater SUPfest race a few weeks ago, this is the kind of novel event that can make SUP racing more fun and even help attract a new crowd of competitors. It’s also very interesting being able to compare paddlers side-by-side, with all the standard race variables are taken out. No drafting, no buoy turns, no bumps, no waves… When you remove those unpredictable factors it becomes a pure drag race where the fastest paddler wins. Simple. I can also imagine this kind of racing would also be a dream for a flatwater board (and paddle) designer. With no outside factors (waves, buoy turns, etc) influencing the result, it really comes down to just each paddler and their equipment. All three of these events, the Silver Blade, the Lost Mills time trial and now the Aus Flatwater SUPfest, have been on 14′ SUP race boards. But let’s extend the numbers to other paddling sports. 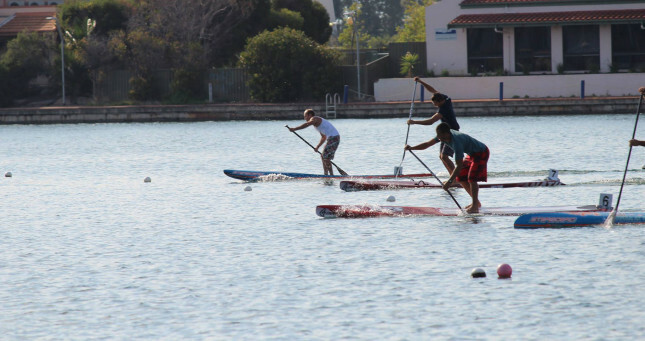 How close is SUP racing to canoe and kayak? So we’re still obviously a lot slower than the canoe/kayak guys, though keep in mind that C1 and K1 boats are 520cm (just over 17 feet), which is 93.28cm (or roughly three feet) longer than 14′ SUP race boards. Looking at this whole “racing in lanes” format with the future in mind: While I don’t wanna see this kind of SUP racing ever fully take over and become the pinnacle of the sport, I do believe it has its place and I’d love to see events like the SUPfest grow (or in other words: This looks like a cool race and I’d like to see more of it, just so long as the Battles and Molokais remain the most prestigious events). Though from a spectator point of view, I can imagine these races are a lot easier to follow than events like the BOP (and definitely a lot easier to follow than something like Molokai…), so that’s something to keep in mind. However my only concern is that if this kind of SUP racing keeps growing (and I hope it does), it *could* potentially morph into stand up canoeing as the board design evolves… Nothing necessarily wrong with that, but then what if everyone realises it’s faster when you kneel on one knee rather than stand up on both feet… then we’ll end up with high kneel canoeing rather than stand up paddling… and then someone will realise the optimal boat length is 5-6 metres… and then suddenly we’ll realise we’ve gone and created a sport that was actually invented 70 years ago. 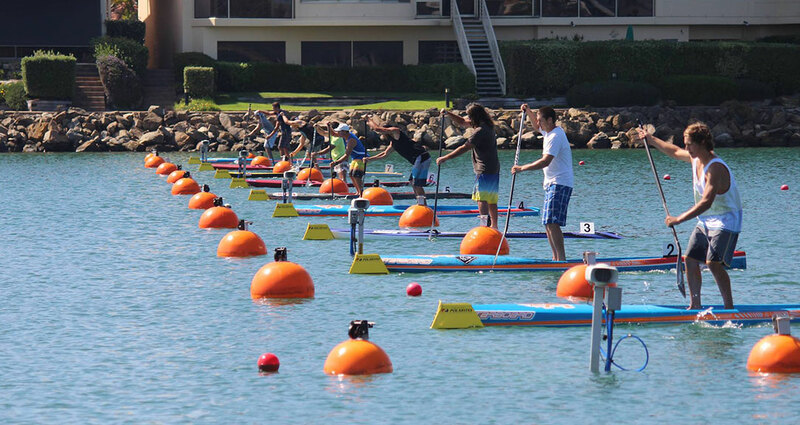 Of course we could avoid that with simple board restrictions, but apparently nobody wants those ;-) So yeah, I’m getting waaaay ahead of myself here, but it’ll be interesting to see what this kind of SUP racing looks like in 5-10 years time. 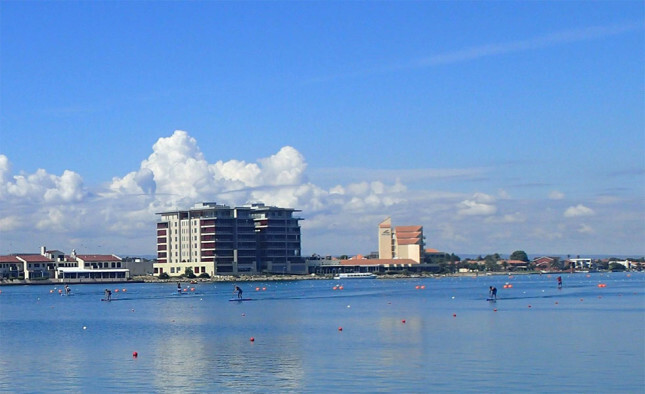 UPDATE: Turns out some people do appreciate the benefits of board restrictions: Organisers of the Australian Flatwater SUPfest were actually following SUPAA’s provisional board restrictions for width, weight and deck recess. Very interesting. And good to know my apocalypse scenario mentioned above won’t happen, at least not in Australia. SATURDAY UPDATE: Results are coming through… Angie Jackson takes out the women’s 500m. Trevor Tunnington takes out the men’s final, leaving three very big names to scrap for the minor placings. It was a very tight race with only three seconds separating the top four after more than two and a half minutes. All reports from the paddlers suggest it’s been an amazingly well organised event and that the racing itself is really exciting to watch. SUNDAY UPDATE: Results are coming through… Looks like Paul Jackson has shown up the kids, taking out the men’s 200m final ahead of the 500m winner, Trevor Tunnington. Full results below (…the 5km race is still yet to come). SUNDAY UPDATE #2:With Jacko, Jake and Angie hopping on a plane to Brazil at lunchtime, the final event on the schedule, the 5km race, had a slightly smaller field. Provisional results show Beau O’Brian took the distance win, which, combined with his runner-up in both the 200m and 500m, gives him the overall victory. Click here for the raw results.